EST Companies LLC (EST) is a HUBZone small business and GSA Contract Holder, founded in 2006. EST specializes in sales, installation, service and maintenance of large scale wash technologies and corrosion control facilities designed for aircraft, military, commercial, industrial and mining applications. Systems can be designed for manual or highly automated wash systems utilizing complex PLC controls, large pumps and motors, water filtration systems, oil water separators, and other custom technologies. EST sales and service technicians operate fulltime throughout the continental USA, Hawaii and Guam. EST also performs services globally on a contract basis. DESIGN: EST works with A&E firms to design every type of wash facility from a single wash rack, aircraft hangar wash, clear water rinse system to central vehicle wash facility. CONSTRUCTION: EST performs onsite equipment installation around the world for it's products. EST can perform all tasks associated with equipment installation; running conduit for electrical controls, above ground plumbing including pipe threading, welding, confined space entry, onsite component fabrication and all other associated tasks. All EST employees are MSHA and/or OSHA-30, equipment handling and lift certified, ensuring a safe worksite. EST supervises the project from start to finish ensuring both the general contractor and customer are fully satisfied with the equipment and work performed. SERVICE & PREVENTATIVE MAINTENANCE: EST provides maintenance and service on all wash equipment regardless of the manufacturer. 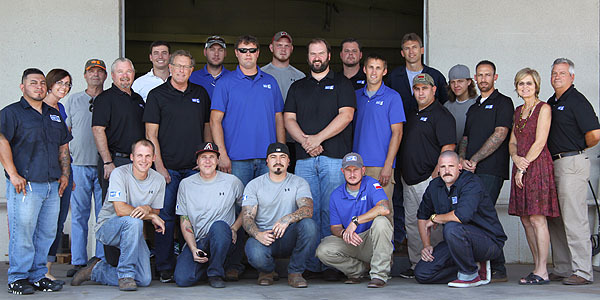 Service technicians show up onsite in fully stocked service vehicles and are fully trained to handle various complex systems. EST’s largest service contract covers all 35 wash rack sites located at Camp Pendleton, CA. EST has extensive experience servicing the following manufactures wash equipment; Riveer, Cyclonator, Milspray, Hydro Engineering, RGF, Hotsy, Landa, Watermaze, Waste to Water, ESD, Enviremedial Systems, Watercycle, Hydrotek, Stanton Systems, Aqua Blast, Karcher, AOK, NS Wash, Ryko, Interclean, AquaCycle, Dultmeier car wash systems, and many other sophisticated custom systems. Testimony to our ability to serve global and often remote customers, Riveer has selected EST as the company’s lead support organization, responsible for installation, training and ongoing support of Riveer’s growing line of aviation, commercial, industrial and military equipment washing system. Founded in 1983, Riveer is the recognized leader in developing and manufacturing equipment and systems that can withstand the harshest environments, including tropical, desert, off-grid and 24/7 industrial processes. Riveer’s expert engineering has been proven worldwide, delivering unsurpassed performance through superior engineering and years of experience. Located in South Haven, Michigan, Riveer ensures your equipment is clean and corrosion free, and your operations are in compliance.